In the early morning hours of Saturday, February 24, Grandview resident Joshua Jenkins noticed that his street seemed to be full of what he considered fog, but quickly realized from the smell that something was on fire. He then discovered that the heavy smoke was coming from a neighbor’s house at 13803 10th Terrace. Jenkins immediately called 911 to report the fire, and then approached the home where he saw flames through the living room window. 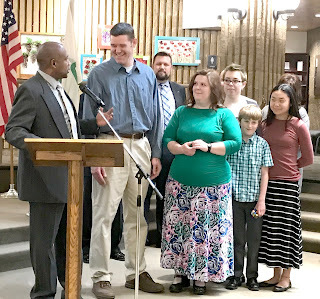 “After witnessing one of the occupants breaking out a window in the middle room of the house, Joshua reported to the 911 dispatcher that there were people trapped and could see the fire in the living room growing larger,” said Grandview Mayor Leonard Jones, who presented Jenkins with a proclamation during the Tuesday, March 27 Board of Aldermen meeting. Shortly after, Grandview police arrived, followed by the Grandview Fire Department. Upon investigation, it was discovered that the home had no working smoke detectors. 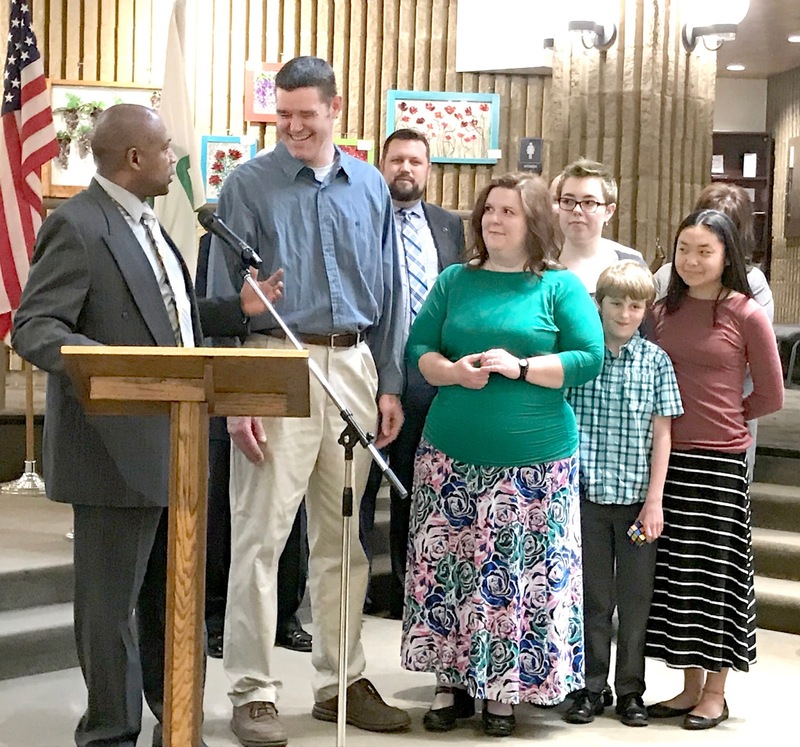 “Fire Department staff believes that by stopping and becoming involved in reporting the house fire, Joshua saved the lives of the three trapped occupants who only had a few minutes to spare before being overcome by smoke inhalation,” said Jones. According to Austin, one occupant was admitted to intensive care for severe smoke inhalation, one was unconscious when they were rescued and they all suffered from lacerations and other injuries from the fire. The City of Grandview Fire Department receives donations of smoke detectors from the American Red Cross organization, and the department purchases any additional that may be needed for homes in the community. For his actions, Jenkins received further recognition from the fire department. He has been a Grandview resident for 23 years, and lives with his wife and three children. Jenkins has also completed the Community Emergency Response Team training as well as additional safety training in the Boy Scouts, his church and from his family. If you are a Grandview resident in need of a smoke detector in your home, you can contact the Grandview Fire Department at 816-316-4961 to have one installed at no cost.